"What gives you the right to speak for God?" Sinclair Lewis' satire on evangelism and charismatic religion, Elmer Gantry, packed a powerful punch when published nearly 75 years ago, since America dislikes having anyone point out its hypocrisies and religious shallowness. This theme was recognized in the United Artists film of the novel over 30 years later, to the point that the producers even felt compelled to begin the film with a disclaimer. Burt Lancaster stars as huckster-salesman-turned-Bible-beater Elmer Gantry in Richard Brooks' movie. Gantry's past is checkered at best, including a dismissal from theological school for having his way with the deacon's daughter in the chapel after his Christmas Eve sermon. A boozer and brawler, Gantry is a thorough fraud and womanizer who is nonetheless able to convince his hearers of his sincerity. When he runs across an itinerant tent preacher, Sister Sharon Falconer (Jean Simmons), Gantry builds a grandiose dream of taking her rustic act to the big city of Zenith. All goes well there until he begins raiding brothels, where amongst the fallen women he finds Lulu Bains, the deacon's daughter (Shirley Jones, in an Oscar®-winning role). While he has thoughts of kindling romance with Sister Falconer, Gantry is also tempted by lust to fall into the trap of Lulu's desire to blackmail him. Lancaster does a superb job as the title character, believably smarmy and convincing throughout, yet with feet of something less than clay. Jones is incredibly sensuous as the prostitute Lulu, a far cry from Mrs. Partridge. Jean Simmons is gorgeous but essentially uninteresting as Sister Falconer. Worthy of note is veteran character actor Edward Andrews as Zenith booster par excellence George Babbitt. Arthur Kennedy does a decent job as journalist and H.L. Mencken disciple Jim Lefferts, who first exposes Gantry and then is reluctantly used by Gantry in his schemes. The adaptation suffers a little in making Sister Falconer a more thorough Christian template and changing her into a bona fide faith healer, a move that Lewis must have cringed at. However, the complexities of the characters and the dizzying changes of the mob from adoration to revulsion make this picture hold the viewer's attention raptly. Even though somewhat watered down for popular audiences, the film still has power and relevance as we see televangelists and charismatic denominations looting their public, and such notables as Jimmy Swaggart and Jim Bakker using their pulpits to further their own sinful ends. Of course, those who would benefit most from seeing the film will dismiss it, but it's an important piece of work nonetheless. Image Transfer Review: The nonanamorphic 1.66:1 picture is quite attractive throughout, with decent colors. Blacks are often quite weak, but except for a few speckles at the very end and very beginning, this is a beautiful print. Detail is excellent and the picture is clear most of the time. There is slight ringing visible in a few scenes. Considering this picture was shot with notoriously unstable Eastmancolor film stock, this DVD looks quite good indeed. Audio Transfer Review: The sound is a nondescript 2.0 mono. While there is little hiss or noise, the rousing Andre Previn score is quite lacking in depth and bass. Worst of all, the opening theme is warbly and distorted to the point of being painful to listen to. Surely there was a better audio stem of the main title to be found than that found here? Extras Review: The only extra is an interesting but scratchy 1.33:1 trailer. It opens with an amusing introduction by Lancaster that makes its presence quite welcome. Chaptering is rather insufficient for a movie of this duration, and MGM's annoying failure to provide English subtitles rears its ugly head here again. Why are there no English subtitles, though French and Spanish ones are provided? 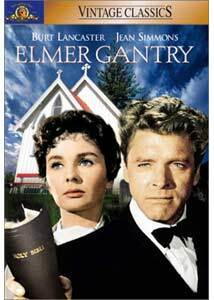 An important and still relevant satire on Christianity in America, Elmer Gantry sports a terrific lead performance from Lancaster and MGM gives the film a nice transfer to boot (though the audio is awful during the main titles). Lacking in extras, but highly recommended.